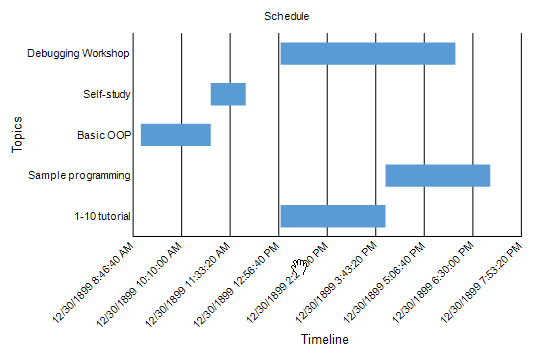 The Gantt charts are used to represent the schedule of sequence of tasks in a project. 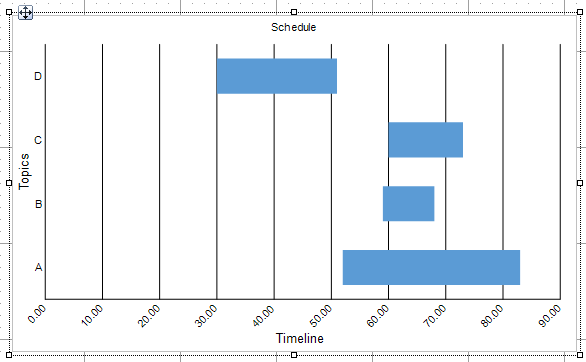 To plot Gantt charts, you need to have the start and end times of a task. This walkthrough uses the ScheduleOfTime table from the Schedule database. By default, in ActiveReports, the Schedule.mdb file is located in the [User Documents folder]\GrapeCity Samples\ActiveReports 13\Data folder. In the New Project dialog that appears, select ActiveReports 13 Page Report Application and in the Name field, rename the file as rptGanttChart. On this page, create a connection to the Schedule database. See Connect to a Data Source for information on connecting to a data source. In the DataSet Dialog that appears, select the General page and enter the name of the dataset as ScheduleData. To obtain end time of the tasks, you need to add a field that calculates end times. Go to Fields tab and add a calculated field EndTime with expression =DateAdd(DateInterval.Hour, [Hours], [StartTime]). From the toolbox, drag a Chart data region onto the design surface of the report. In the Select a Chart Type wizard that appears and select the chart type as Column. Right-click on the chart and go to Plot Template > Miscellaneous and select Gantt. Note that the chart changes to horizontal bar chart, where horizontal axis (AxisType Y) represents time duration that a task needs to finish and each bar (plotted along Vertical axis (AxisType X)) represents a task. Select the chart control so that the chart adorners are displayed. Right-click the Data Fields adorner and click Add. You see that a field is added. Select the field and click the ellipses next to Subfields property to open Complex Fields Collection Editor. Set lower value to =Fields!StartTime.Value and upper value to =Fields!EndTime.Value to show Value axis. Click OK to save and exit the collection editor. Right-click the Category Fields adorner and click Add. You see that category 'Category0' is added. Select 'Category0' and set its Expression to =Fields!Labels.Value. Select 'Chart title' on the chart and set Title to 'Schedule'. Select Category axis (AxisType X) and set Title to 'Topics'. Select Value axis (AxisType Y) and set Title to 'Timeline'. Select the Topics axis and set Title>TitleStyle>Font>FontSize to 10 pt.